My journey from a blank page to twisted terror! The writing of Misguided Science. I was new to the fiction writing scene. I mean new – as in babe in the woods. Still in diapers and clueless on how it all works to publish a story people want to read. Sure, I knew how to write, “Doesn’t everyone?” I thought. You just write. I still believe that to a degree today. But to make a great story that the audience will connect with takes investment in the craft of writing. I’ve been learning more and more about writing and publishing fiction since I wrote this story years ago. The more I learn, the more I realize I don’t know and so, I charge on, reinvigorated by the creative process and all that I need to learn about crafting a story that may appeal to the masses. I love writing without restrictions and I truly enjoy hearing how readers react to my writings. Misguided Science was the result of a writing competition. My first and definitely not my last. I was lucky that I surrounding myself with seasoned writers, published writers. Stranger still, I didn’t know it at the time. They were fun, quirky, down to earth people from all over the world. We had a blast razzing each other, joking, but all the while, mentoring and critiquing each other’s words so all of us were improving. As I received encouragement and criticism, I was learning about all of these people I interacted with on a regular basis. This was an online writing group and that type of interaction was also new to me. 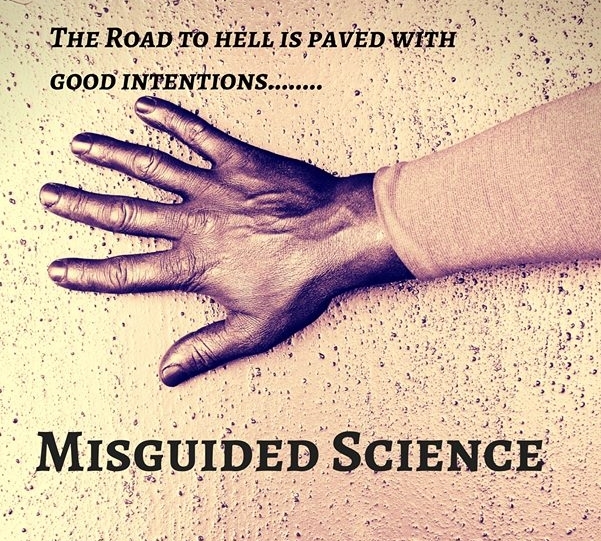 So – on to the making of Misguided Science. It was a competition for zombie horror. Now, the zombie craze wasn’t in the mainstream like it is now, but I’m sure many of the others in the group were attune to the up-tick within the industry. Remember, I was still in diapers at this point. I read horror, but I really hadn’t considered being an author in that genre – or any genre. I was enjoying the creativity and learning experience. As was my process during college for any large paper, I run it all in my head. Now, if you’re a seasoned author and use outlines or story boards, my method definitely strikes against the norm. However, since then, I’ve learned every writer is different and writing processes are unique to the individual. I don’t like the rigid feel of the traditional outline process so I went about it in my own way. Several ideas ran through my mind for a story idea. However, if you’ve read my bio anywhere, you know I love sciences: biology, genetics, and environmental sciences to be more precise. So an idea sprung to mind of a wickedly mad scientist, with a twist. I let that idea simmer for days, maybe over a week or more. I can’t remember how long, but as I go about my life working, chores, washing dishes, folding laundry, driving my kids to activities – the story is building in my mind. I don’t write anything down, but let the images and scenes develop in my mind. Once I complete all the research and have run the story through my mind, I sit down and write. For Misguided Science, I researched zombie tales. Since I wasn’t an expert on horror, I didn’t want to appear a complete zombie novice. I also researched the meaning behind surnames, voodoo, chemicals, and medicines that have various affects on the body. It was fascinating. Although fiction, I like to substantiate my writing with truths, or fiction that uses real enough principles to sound believable to the reader. Once I had what I thought was a believable concoction, my story was ready for the blank page. An all or nothing personality, I sat down, I’m sure cross-legged in the big living room chair, with the laptop balanced on my legs and a blanket or pillow to keep it even as I typed the story. I typed the story out in two days. If I didn’t have a family, I probably would have sat there and finished it in one day, ensuring I punched it all out as I had the scenes rolling in my head. But I am conscious of how holing myself up to write can have a negative affect on those around me. So I try my best to balance everything in my life. Once finished, I saved the file and left it alone for a few days. I’m a seasoned writer and editor in technical communications, so I knew I needed to step away from the story in order to look at it with fresh eyes for a proper first edit. A week later, after edits I submitted the story. Although I didn’t win the top honor in the contest, I was beyond giddy to find out the story was accepted for publication. So, I was a horror writer. How insane was that? Well, I was happy and enjoyed the entire process so much, I kept going, writing other horror stories and stepping into other genres such as poetry, mystery/thrillers, and young adult. I hope you enjoy reading Misguided Science. It is my first story that was published so it sticks with me for that reason. I’m thrilled and honored that Visionary Press Collaborative has given new life to this story and offered to re-publish. I’d love to hear your thoughts after reading Misguided Science. Any questions you have, I’ll do my best to answer quickly. All of us at Visionary Press Collaborative are glad to have you onboard, Sirrah! What a delightful story you gave us. I’m glad you share your zeal for your tale in this post.